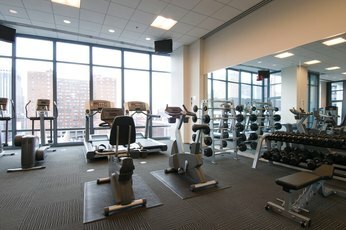 There's pros and cons to any piece of workout equipment. 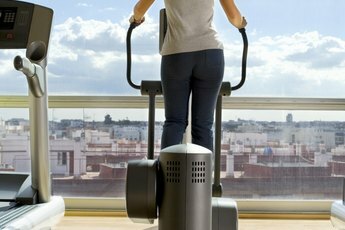 Whether you're putting together a home gym or are trying to decide which machines in your health club to use, knowing the differences, benefits and drawbacks of various weight equipment can help you decide which machine will work best for you. Hydraulic equipment and stacked weight equipment, for instance, were designed to make resistance training safer and more accessible than free weights. The experience you'll have with each will be as different as the machines. Hydraulic equipment and weight stack equipment are both supposed to provide a workout similar to free weights without the numerous pieces and parts or the injury factor. Hydraulic equipment provides resistance with a part of the machine that is a lot like a shock absorber. The resistance piece has chambers inside of it and you push, pull, lift and press fluid from one chamber to the other and back. Want to increase the resistance? No problem, just adjust the levers on the machine to increase or decrease the measure of force you'll have to exert to move the fluid from chamber to chamber. With weight stacks, you'll still be using weight plates like with free weights, but they're all piled neatly on the machine and cannot be removed. The resistance is provided by attaching various accessories such as handles, bars and cuffs to cables that run along pulleys and are connected to the top weight in the stack. Increasing and decreasing resistance is easily done by moving a pin down or up in the stack so that you're "lifting" more or less of the plates. There are benefits to both hydraulic machines and weight stack machines, and which one you decide to use depends on which ones best fit your needs and expectations. With hydraulic machines, you can stop at any point in an exercise because there are no weights at all to come crashing down if you don't make it entirely through the move. They're also better for working at your own pace, as hard or as light as you want. 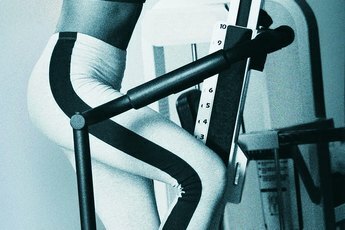 In addition to adjusting resistance by moving the levers around, moving quickly through an exercise on a hydraulic machine will increase the intensity. Hydraulic equipment is easier on your joints, too. Weight stack machines give a more realistic free-weight feel to your workout, particularly if you're working on isolating muscle groups, a specialty of weight stack machines. Many weight stack machines are multistation, meaning one piece of equipment can be used for multiple exercises, making them more versatile. The cables allow for more realistic free-motion, too. If the numbers are important, weight stack machines will appeal to you because the amount of weight in pounds is stenciled on the plates, so you know exactly how much weight you're working with each time you move that pin. No machine is perfect, and there are drawbacks to using both weight stack equipment and hydraulics. The stacked equipment doesn't flow as smoothly because of the cable and pulley system that makes it work, sometimes causing it to stick and jerk if the equipment isn't maintained perfectly. With weight stacks, you have to be able to see the exercises through to the end because getting to the top of a movement and letting go of the resistance is a lot like lifting a barbell and then dropping it on the floor. You'll have less chance of hurting yourself when doing this with a weight stack machine than with free weights, but the equipment can still be damaged. Hydraulic machines have their shortcomings, too. You can't isolate just one muscle group because hydraulic equipment relies on more than one muscle group to complete an exercise, and usually there is no negative part to the move, either. An example is when working biceps with an hydraulic arm machine, you get the benefits from the positive part of a bicep curl as you curl the handles up, but the second part of the move is then a positive triceps move as you press the handles back down instead of the negative part of the bicep curl. Don't let anyone tell you that this is a plus to the hydraulics; although some refer to negative, or eccentric, phases of an exercise as difficult and awkward and write them off as unnecessary, the part of an exercise where you have to control the descent of the resistance is just as valuable to your workout as the part where you exert the effort to press, push or pull it up. Even though hydraulic and weight stack machines are more safe than free weights, that doesn't mean that injuries can't occur. You still need to use proper form when performing any exercise, no matter what form of resistance you're using. Always keep clear of moving parts, and never use a piece of equipment that isn't well maintained. Even a seemingly insignificant defect like a broken bolt or a loose cushion can lead to an injury. You should always make it a point to warm up, too. 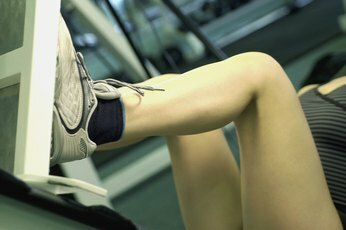 When using weight machines instead of free weights, you're still challenging your muscles, tendons and joints, so it just makes sense to stretch them out and get the blood flowing before putting them through a workout.